With growing awareness of the dangers of poor indoor air quality, effective ventilation is now key to the energy and sustainability agenda. Lee Stones, Senior Product Marketing Manager at Glen Dimplex Heating & Ventilation, discusses recent policy changes surrounding ventilation and how electrical wholesalers can support customers in helping to improve the quality of air we breathe. In May, the Government published its draft Clean Air Strategy, setting out plans to tackle emissions from a range of sources, including agriculture, industry and homes. Acknowledging that air pollution is about more than roadside emissions from diesel cars, the consultation document raises – amongst other issues – the emerging health issue of indoor air quality. And in doing so, it reinvigorated the focus placed on the quality of the air that we breathe indoors. The Clean Air Strategy notes that up to 90% of our time is spent indoors and despite years of debate around the detrimental impact of poor pollution outdoors, taking measures to identify and improve the quality of the air we breathe inside our homes and other buildings is a relatively new (yet rapidly growing) notion. In fact, the levels of some air pollutants are often far higher inside than they are outside1. The biggest cause of poor indoor air quality is Volatile Organic Compounds (VOCs), which can be emitted from a whole host of everyday items such as furniture, carpets, paints, cleaning products and even building fabrics and materials. VOCs can be detrimental to a person’s health, especially when exposed to them for long periods of time. They can also aggravate pre-existing health conditions and cause fatigue, dizziness and headaches. Moisture is another source of poor air quality, with a risk of mould in bathrooms or from drying damp clothes, whilst carbon monoxide, odours, carbon dioxide and tobacco smoke are all known pollutants in buildings too. The effects of all these issues will be further increased as increasingly stringent energy efficiency targets have driven the development of better insulated buildings, leading to a decrease in natural ventilation and even more air tightness in properties. Whilst this is a huge issue for customers working in commercial sectors such as offices, education and healthcare, the issue applies inside the home too. Especially in light of the dramatic changes we have seen in building standards and efficiency targets in recent years that have ensured new homes are warmer and more energy efficient, but they are unable to breathe naturally. Each have their own advantages and disadvantages, with different categories better suited for individual properties, requirements or circumstances, but manufacturers have responded to the challenges with continued development of products across all categories. With growing awareness of indoor air quality, however, it is MVHR which seen the most rapid development and deployment in recent years. 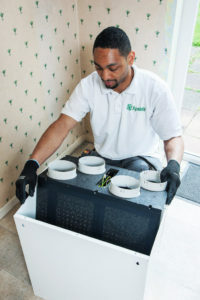 Offering the opportunity to extract air from the building through a central heat exchanger and recover heat back into the air supply, the concept of MVHR is gaining traction as a method of enabling energy recovery whilst addressing health concerns through a cost-effective, mechanical, balanced ventilation system. In fact, MVHR is fast becoming the only ventilation system that meets building requirements. It offers the benefit of providing ventilation that both supplies and extracts air through a property, whilst constantly supplying fresh filtered air. Fitting the new Xpelair Natural Air 180 into a house in Peterborough. Fitter Ahira Gordon removing the case. To increase their effectiveness, the latest MVHR systems from leading manufacturers offer a host of features including ultra-fine filters, PIR sensor activity for enhanced efficiency and cold-climate pre-heating. Uniquely, Xpelair’s Natural Air 180 also uses adaptiflow technology to deliver a constant volume of extracted air, thus giving homeowners assurance of the performance being delivered. Ventilation is not a one-size-fits-all approach and whichever sector your customers operate in, the one constant of a modern ventilation system is the need to balance energy efficiency with management of indoor air quality. With modern ventilation systems, evolving Building Regulations and a greater focus on management of indoor air quality, this is now more accessible than ever.